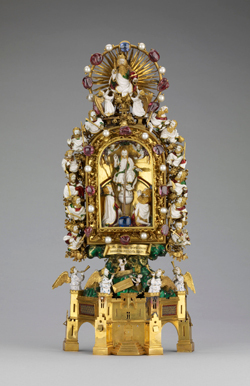 • The Waddesdon Bequest, a collection of medieval and Renaissance treasures left to the British Museum by Baron Ferdinand de Rothschild in 1898, has a new home. Redisplayed in a new gallery which opened at the museum last week, the collection features the Christian relic known as Holy Thorn Reliquary (pictured) – a concocotion of gold, enamel and gems set around a thorn supposedly taken from Christ’s Crown of Thorns, the Lyte Jewel – a diamond-studded locket made in London in 1610-11 to hold a miniature of King James I and presented by the king to Thomas Lyte as thanks for a genealogy he created representing the king as a descendant of the Trojan Brutus, and the Cellini Bell – cast from silver in Nuremberg around 1600 and later displayed by Horace Walpole at his west London villa in Strawberry Hill. The bequest collection, which must always be displayed in a room of its own under its original terms, was first displayed at Baron Ferdinand’s country home of Waddesdon Manor in Buckinghamshire (now a National Trust property) and moved to the museum after his death. The redisplay reconnects the collection with its past at the manor and the history of the museum – the room where it is now displayed, Room 2a, was the museum’s original Reading Room and part of a neo-classical suite of rooms designed by Robert Smirke in 1820. It has been given the “most ambitious digital treatment” of any permanent gallery in the institution. Admission is free. For more, see www.britishmuseum.org. • The “enduring significance and emotional power” of British history painting is under examination in a new exhibition which opened at Tate Britain on Millbank last week. Fighting History features everything from the large scale works of 18th century painters John Singleton Copley and Benjamin West through to 20th century and contemporary works by Richard Hamilton and Jeremy Deller and looks at how they reacted, captured and interpreted key historical events. Works on show include Singleton Copley’s 1778 work The Collapse of the Earl of Chatham in the House of Lords, 7 July, William Frederick Yeames’ 1877 work Amy Robsart, John Minton’s 1952 work The Death of Nelson and Deller’s 2001 work The Battle of Orgreave, a re-enactment of 1984 protest in South Yorkshire. The exhibition also compares traditional and contemporary renderings of events from scripture, literature and the classical world and features a room dedicated to interpretations of the great Biblical flood of Noah. Runs until 13th September. Admission charges apply. For more, see www.tate.org.uk. • A limited number of early release tickets to London’s New Year’s Eve celebrations will go on sale from noon tomorrow (Friday, 19th June). The tickets, the bulk of which will be released in September, cost £10 a person with the proceeds being used to cover costs including printing and infrastructure. As was the case last year, people without tickets will not be able to access the event. To get hold of tickets, head to www.london.gov.uk/nye.